Have you been looking for Free/Cheap Browsing Tweaks to use this 2016? That's great, you have come to the right place, there are browsing tweaks for you now, for a while now many geeks had been using these browsing tweaks to do heavy downloads and Browsing at a very affordable rate, after many demands from friends and fans here, I finally took my time to make this post for all of us. It's an ALL-IN-ONE PACKAGE, tweaks for almost All Nigerian Networks, MTN, GLO, ETISALAT and AIRTEL. Note: These Tweaks below still work in 2016 for MTN and Glo, we will update you on Etisalat and Airtel 2016 tweaks later on. So if you have the Sim listed above, smile as you Grab a Cup of Tea as you'll surely benefit from any or All these Browsing Tweaks below. PC USERS GO HERE and DOWNLOAD SIMPLER SERVER FOR PC. The Daily BBC plan has been blocked for this tweak. BB10 Plan works great ( Send BBMIDID to 21600 - for Daily plan or the Daily plan for 70Naira - Dial *216*7# ). Make sure you get the BIS Activation SMS and 100 or 70 Naira is deducted, once it's active. subscribe to any of your choice by dialing *123*4*1# to choose a plan, you're suggested ouse the Daily BBC plan ( Send BBCDAY to 21600 ), once it's active. Double Click on the ‘SimplerServer.exe to run the application. 2. Connect the modem, with normal APN settings. 3. On Firefox Menu, Click >> OPTIONS >> NETWORK >> SETTINGS >> TICK MANUAL CONFIGURATION, Input the Proxy I.P (127.0.0.1 and Port:8080) and Save. See this Post on How to Configure your Browser to LocalHost. After you're set, be sure the Simple Server is running, Connect your Modem. Open your browser and start Browsing and downloading. Save And Activate it SS your default settings. Leave any other thing , Press Bck to Exit it, Pressing Back will automatically Save your Settings as you Exit. Put on your Internet, Go back to Simple Server App and click START. You can Browse and Download all you want. It powers all Apps. N.B: This particular Tweak dies and resurrects, now look at this pretty Old Post I wrote about MTN BIS Working with DROIDVPN, that was early last year, it had existed even before I updated that post in July 2014... We just invent new methods to keep it alive. I use it when I published this post. It still works. All you need do is Tweak/Repair your Android's IMEI to that of Blackberry. After that, you can Share Connection from your Android to your PC via HOTSPOT. 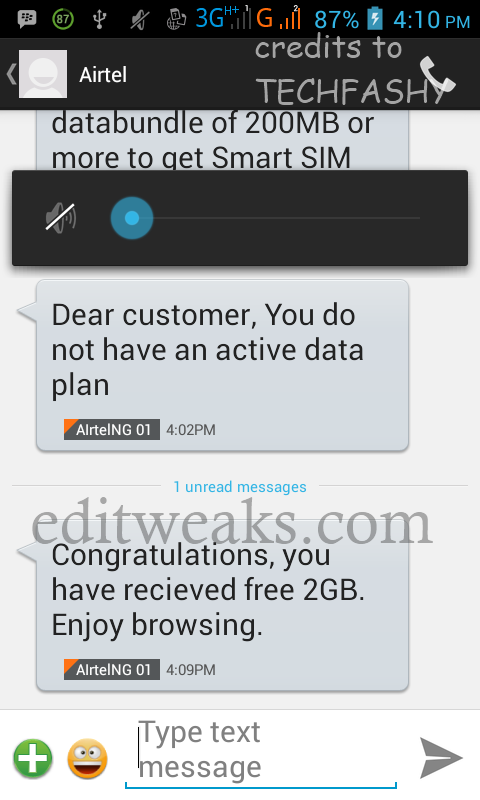 GLO users are adviced to see this post On >> How to use Glo Blackberry Subscription on your Android. This one is Superfast browsing tweak for Etisalat users, but you'll need to be Super Smart to Enjoy it. 2.Recharge N100, they give you 5mb or 10mb depending. 3.Start your browsing, preferably downloading. 4.They usually reset the connection at 55mins, so your download will most likely stop at that time. 5.Just disconnect or switch of your data and then reconnect. No need for codes. 6.After another 55mins, do the same again. N.B - Avoid Video Streaming Sites like Youtube etc when browsing as in Step 3. It's 15 Digits, so you'll need to generate your Unique Numbers and use it to Get your own 2GB from Airtel. You can copy the first 12 and generate others to make it unique. Use IMEI.info to Check Valid IMEI or generate for yourself. After tweaking this IMEI on your Android, Text 3G TO 141 and Enjoy. See Screenshot Of 2GB received Below. You will need to keep checking this post for updated working ones, just incase the one you use gets slow or blocked. Young people love tweaks... never mind anyone telling you it's old stuff, I understand that you and other people who are reading this may be students trying to save some Cash and avoid Expenses, besides if you also check well, you're Enjoying More Data Freedom than people who pay for Data/Internet subscriptions, that's one of the Major reasons I created this Tech blog. To Share Tweaks, unique and Useful Knowledge that works and make Life easy for all our Readers all over the World. Network Agents can walk in here anytime to find this post and Decide to work on blocking it, but it really is none of our Business either. We worked hard to dig out and Write this Long Post, If you Must Copy it, Pls be Kind enough to Give (Credit) Link Back to us where you Got it From. is it possible to root android v5.0 or 5.1 to enable one use mtn simple simple server?